"People think of Woody Guthrie as just a wordsmith. He had very strong melodies." Joel Rafael's new album, America Come Home, features a song he co-wrote with the legendary Woody Guthrie. "People think of Woody Guthrie as just a wordsmith, but he had very strong melodies," says singer-songwriter and guitarist Joel Rafael. "I think he was very calculated in the way he wrote his melodies. He might have based them on traditional songs he'd heard before, but they were very bold - you can remember them. I try to do the same thing with my songs and anything I write to his lyrics, any of the collaborations. I want my melodies to strike a familiar place with people. That's how a song really hits home." You may very well be asking yourself, "How does somebody 'collaborate' with Woody Guthrie?" After all, the legendary folk musician died in 1967. 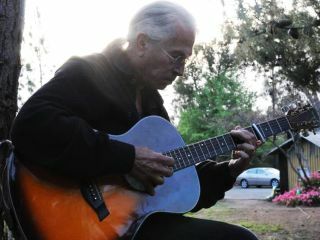 But Rafael, a noted 'Americana power folk' artist does indeed share a co-write with Guthrie on the song Dance Around My Atom Fire, featured on Rafael's bracing new album, America Come Home. Surprisingly, it's not the first time that Rafael put music to Guthrie's words: his 2009 two-CD set, The Songs Of Woody Guthrie Vol 1 & 2, features five Guthrie/Rafael co-writes. MusicRadar sat down with Rafael to find out how the process works, how he feels about non-traditional folk artists such as Tom Morello, and what it's like to sing with David Crosby and Graham Nash. When a lot of people hear the terms "folk artist" or "protest singer," they still have that image in their heads of one guy with an acoustic guitar. But a lot of the tracks on your new album feature a full electric band and big production. "Well, see, I started out as a drummer, so wherever I've gone with my career, I've always taken that strong rhythm section and tempo element with me. But I picked up a guitar once the '60s folk scene happened. I got my parents to take me down to Mexico to buy a cheap guitar. I do like upbeat tempos, though, sure. That's always been there with me. "For some reason, I've always been genre classified as 'folk,' even though the traditional folk community has never accepted what I do. And, of course, the pop community looks upon me as a folk artist. I think I'm somewhere around there. A lot of my early stuff had drums and bass - all that. However, I definitely subscribe to that singer-with-a-guitar-write-a-song-about-what's-going-on notion. Social observation, sure, that's what I do. But I wouldn't say I'm a traditionalist." Speaking of non-traditionalists, what do you think of what Tom Morello has been doing as The Nightwatchman? "Oh, yeah, he's great. I've been on some shows with Tom, and I think he's a real champion for people and workers' rights. I was just on a show with him in Los Angeles, a big Woody Guthrie birthday show, and it was a real who's who and a who's not of music. [laughs] There were people on there that nobody ever heard of, you know, like myself - I'm not very well known. But you also had really famous people like Jackson Browne, Graham Nash and Kris Kristofferson. "But I'll tell you, no one can lead a version of This Land Is Your Land like Tom Morello. He gets up there and he gets people jumping up and down. It's pretty exciting. I love Tom's approach, absolutely. But there are those in the folk community who are maybe more traditional, and they're put off by what he does. He's too much for them, a little too in-your-face." It reminds me of Dylan going electric - because Tom started out The Nightwatchman as a solo acoustic artist and then worked in the electric guitar and the full band. "Yeah, absolutely. Man, if you've seen the footage from the documentary on Dylan, that transition - he started out as the naïve young kid with a guitar to the hip, bohemian rocker. Labels are funny things. Folk artist, protest songs - Woody Guthrie even said that when he first came to New York; he'd never heard the terms 'folk song' or 'folk singer.' Immediately that's that they called him. To him, a good song was a good song. Coming from Oklahoma as he did, music was just music." Your song Dance Around My Atom Fire has some pretty hot lead guitar on it. I imagine it's not what Woody Guthrie was imagining with he wrote the lyrics. "No, probably not. But the guitar playing does fit the title - it's explosive. I wanted the song to have a lot of energy because it was about atoms and the potentials of atomic energy - the potential disasters and wonderment of it all. I think Woody wrote the lyrics in 1948. He had just seen a movie called The Beginning Of The End, and it made him really think about nuclear power. "But as far as the guitar solo goes, like I said, I'm not a traditionalist. I was exposed to so much music growing up. Mixing up genres comes very naturally to me." You've put music to the words of Woody Guthrie before, but explain the process. How does one get to "co-write" a song with him, so to speak. [laughs] "What happened was, it was in 1998 when Mermaid Avenue, and there was this prospect now of other artists putting music to Woody's lyrics. Nora Guthrie, Woody's daughter - Arlo's sister - she was giving lyrics out to people. I went to some of the Guthries I knew, like Arlo's daughter Cathy, and she put me in touch with her aunt. At this point, Arlo gave me the thumbs up - he knew about me. So, through the whole process, I was invited into the archives. It was all pretty amazing." When you approach writing the music to a set of Woody Guthrie's lyrics, what kind of weight of responsibility do you feel? "You just start finding a melody. It's very intuitive. I don't feel the vibe of responsibility, really. I just respond. But when I start recording, that's when I find the vibe of Woody coming to me. He works his way into me." The song America Come Home features David Crosby and Graham Nash. Do you sing differently knowing that their voices are going to blend with yours? "I did the first time, yes. We've had the opportunity to sing a couple of times, so now I don't. Although come to think of it, when I sent them a demo of America Come Home, I altered the way I sang the chorus melody, which was where they were going to come in. I kind of took a part that would lend itself to thirds. Of course, then Graham explained to me that they didn't really do thirds. 'We won't really do those kinds of harmonies, like barbershop quartets or anything,' I think he said to me. "The first couple of times we played that song before we recorded it, we sang it in parallels. But you know, they're such great singers, they can find their way around anything that I'm doing, or whenever they work with other artists. They're very different: Graham is very fast, but David takes his time. The way they highlight a chorus, it's just stunning." Do you have any particular guitars that you favor? "I have Martin and Taylor guitars. The Martins are pretty old and delicate, so I don't like to take them on the road. But the Taylors are great. They sound terrific, and they hold up well. To me, they're like Martins in the way they respond. I consider them to be my workhorses at this point."